We’ve been hoping for some indicators for the ZenPad 8.0 (Z380C/Z380CX/Z380KL) accessories coming to North America. 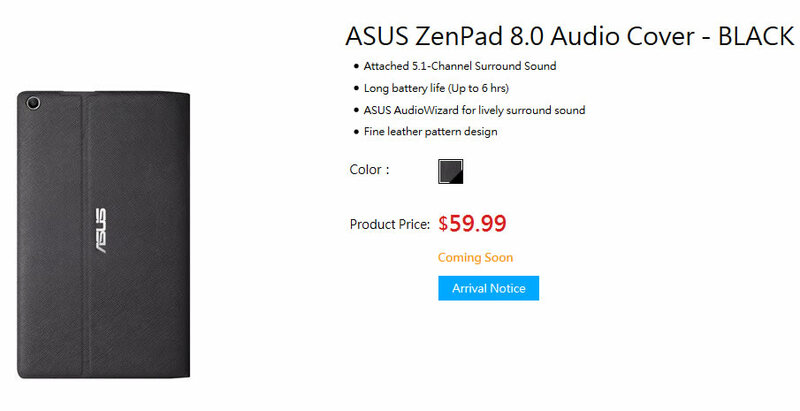 We’ve spotted the Audio Cover in the Asus US online store, priced at $59.99 and listed as “Coming Soon”. Not shipping, but seeing a listing does suggest it’s going to be available to buy very soon. Outside of Taiwan, we really haven’t found any retail listings or pre order availability. Both the Power Case and Audio Cover are impressive accessories and exclusive to the ZenPad 7.0 and ZenPad 8.0 tablets. As a quick recap, the Audio Cover features 5.1-channel surround sound and even includes a subwoofer. It has a 6-hour battery life and interacts with the Asus AudioWizard app.